2011 Bay Colt AHR 654958 SOLD! Garcon Noir MF displays early signs of being a great English athlete. He is exactly what his pedigree predicts, demonstrating the blood runs true. 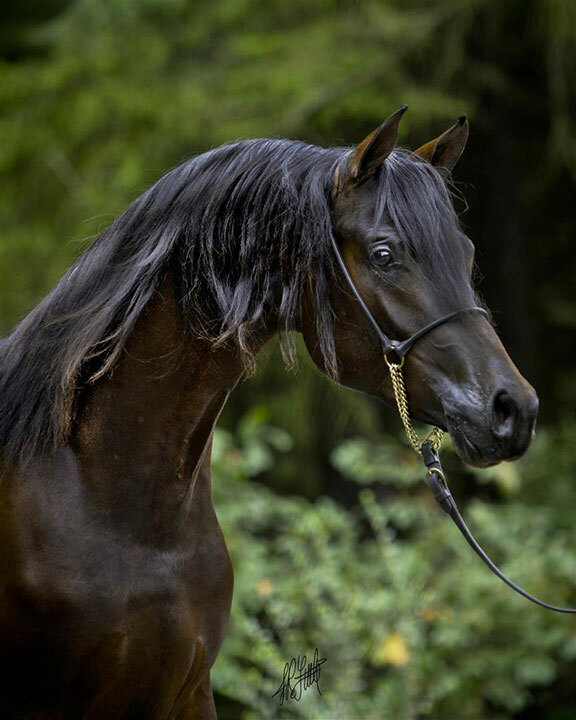 Drawing from the Polish strength of MHR Nobility, *El Ghazi, and *Bask from his sire, we also see the supreme atleticism of his dam’s sire Medalion, and the beauty of Negatraz and Noir’s granddam, the great *Gitara, written all over him. He is the image of his sire, nearly black bay in color, with a familiar hooky neck, cadenced trot, prominent withers, athletic shoulder, and built to drop his hind end and throw dirt backwards. This colt excites us with focused potential in the English Pleasure divisions. A study of pedigrees would turn up pages of accolades for each of the individuals in the first four generations of his lineage. His sire, U.S. National Park Champion IXL Noble Express+, has produced some of the most notable and head-turning performers in the showring today. Two of them – Black Daniels and Expressly Bella – caught our eye at Scottsdale, enrapturing the crowd and convincing us of the source of their explosive talent. We paired the extreme athletic ability of IXL Noble Express with the unique qualities we loved in *Gitara PASB, which are so evident in Garcon Noir’s dam, Ginuine, the enchanting Medalion daughter. The fluidity, extreme motion, and work ethic coming from Noble Express, coupled with an eccentricity and airs-about-one’s-self that Ginuine rightfully possesses, combine magically to make this colt special. This entry was posted in Opportunity, Young on March 30, 2015 by Anita Enander.